This book won’t teach you how to be a selfish pig. But it will tell you what a lot of people think about pigs, robots, the tooth fairy, and more serious topics like God and right and wrong and what’s worth living for. You’ll meet a lot of people in this book, real ones, who have tried all kinds of lifestyles with all kinds of results. What they have in common is that they all, at one time or another, took a serious look at their lives and their worldviews. You’ll laugh and cry with these people. You’ll learn how you could end up a selfish pig and why you might not want to. From helping others in times of need, to keeping and maintaining friendships, to having a positive attitude, Laura’s words of wisdom in Writings to Young Women from Laura Ingalls Wilder: On Wisdom and Virtues are applicable even in today’s world. As she shares stories and experiences from her own life, she encourages readers to live lives of integrity and to realize their dreams. Walden; or Life in the Woods is an American book written by noted transcendentalist Henry David Thoreau. The work is part personal declaration of independence, social experiment, voyage of spiritual discovery, satire, and manual for self-reliance. Published in 1854, it details Thoreau’s experiences over the course of two years in a cabin he built near Walden Pond, amidst woodland owned by his friend and mentor Ralph Waldo Emerson, near Concord, Massachusetts. 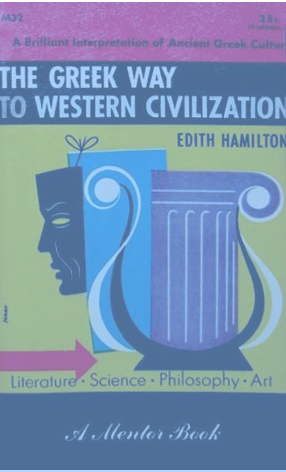 From title page verso: ‘This book includes the material published in 1930 by W. W. Norton & Company, Inc., under the title THE GREEK WAY, and the additional material pulished in 1942 in THE GREAT AGE OF GREEK LITERATURE.’ The Greek Way is a profile of one of the most advanced civilizations aesthetically,culturally and in thought. The book profiles the high ideals of their society and focuses on their writers. 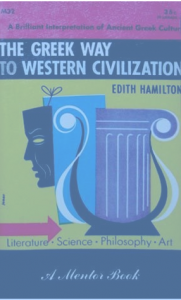 The conclusion of the book states that the Greeks understood that they were part of a greater whole and that the rest of us, including the modern west believe that we are the whole.